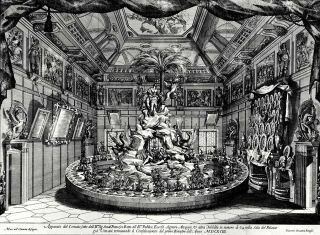 In this sumptuous installation which was organised by Francesco Ratta theatrical baroque pomp is evident. At the end of his charge, lasting two months, each Gonfaloniere had to offer a banquet at his expenses to his colleagues (the Anziani). It was a good occasion for exhibiting grandiosity, riches and celebrating family prestige, even if these heavy expenses were ultimately fatal to personal finances. This spectacular banquet is documented by a series of eight prints. They portray the decoration of the open gallery with garlands and depict details of some of the interior decorations. The room in the residence once owned by the Vizzani family (nowadays Sanguinetti, Via S. Stefano, 43) has as its centerpiece a spectacular sugar trophy designed by the sculptor Giuseppe Maria Mazza: one-meter-high, wrought after the techniques of the glass masters of Murano by the confectioner Giovan Battista Zacarini. It is a surprisingly rocky mountain made of silver and veiled in green, reflective of the famous Bernini fountain in Piazza Navona, it is surrounded by the allegorical statues of the four rivers. From their urns is an outpouring of delicious food. This space is encompassed by a great table for 66 guests, which because of its round shape priority problems were averted. The room scenography bears the family heraldic symbols. Golden griffins and palm leaves clearly allude to the prosperity of Bologna during the government of Francesco Ratta. Along the green damask covered walls small mirrors are hung, tilted to multiply the original and artistic compositions of bottles and precious plates which are scattered all over. The Hall, painted by Tommaso Laureti (n. 1530 – m. 1602), shows in the middle of the ceiling Victory Presenting Fame with the World Conquered by Alexander the Great and a frieze with Alexander's adventures successively covered by new decorations. At the end of his charge as a Gonfaloniere (the most significant political position occupied in turns every two months by the Bolognese senators until the age of Napoleon), Francesco Ratta offered the Anziani a memorable banquet. On this occasion, the Hall of his residence was transformed thanks to a baroque ephemera set documented by this series of etchings and a printed description. Bequest of Giovanni Gozzadini (1902). Mazza, G. La custodia d'oro goduta nel vigilantissimo Confalonierato dell'illustrissimo signor senatore Francesco Ratta e simboleggiata nel di lui sontuos.mo convito fatto all'ill.mo publico, & ecc.si sig.ri anziani il primo bimestre dell'anno 1693, Bologna, 1693. Bellettini, P., Campioni, R. and Zanardi, Z. Una città in piazza, Comunicazione e vita quotidiana a Bologna tra Cinque e Seicento, Bologna, 2000, pp. 155-156, fig. 19. Il magnifico apparato. Pubbliche funzioni, feste e giuochi bolognesi nel Settecento (exhibition catalogue) (ed. S. Camerini), Bologna, 1982, pp. 21-31. Ottani Cavina, A. “Le feste, gli apparati d'occasione”, L'arte del Settecento emiliano. Architettura, scenografia, pittura di paesaggio (exhibition catalogue) (ed. A. M. Matteucci), Bologna, 1980, pp. 209-212, fig. 318-322. Copyright image: Biblioteca Comunale dell’Archiginnasio di Bologna. CV: Graduated and specialized in History of Art at theUniversity of Bologna. Since 1985 she is curator of the Prints and Drawings Department of the Archiginnasio Library. She has written essays and organized exhibitions about drawings, prints and artistic literature of the eighteenth and nineteenth centuries, especially in Bologna. She has also studied photographic collections, as well as the iconographies of the poets Giacomo Leopardi and Giosuè Carducci. She has given lectures and conferences for several public and private institutions. Graduated and specialised at the University of Bologna. She is a specialist in Bolognese late Baroque art, namely sculpture. Among other subjects she has been studying nineteenth-century funerary art in the Bologna monumental cemetery, la Certosa.